The Magnetter organizer from Umbra has a clever, subtle design. No more searching for your keys, bills, or DVD rental in the clutter on your entryway table: this simple wall-mount organizer keeps essentials separated and in full view. A strong, hidden magnetic strip along the lower half easily holds several sets of keys - even car keys with alarm controls. 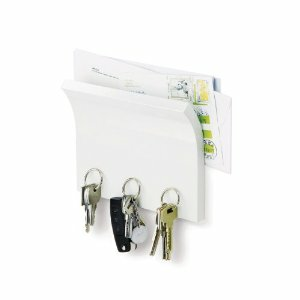 The gracefully curved upper portion accommodates mail, movies, tickets, or any materials you don't want to leave behind in your mad dash out the door. The organizer's simple design blends in to its surroundings. Available in three finishes - White, Natural, and Espresso - the unit measures 8 x 6 x 2 inches and includes hidden mounting hardware.